Our expert tips will help you make the most of the space in your cloakroom. One of the great benefits of adding a cloakroom to your home is that you’ll add value and function without losing too much space. The room may be small, but that needn’t stop you being bold – as the bathrooms below prove. However, before you get carried away with the look of your new cloakroom, spend some time considering the practicalities of the design. Our experts will guide you through some of the key considerations. Kaldewei’s Cono washbasin, priced around £626, will stand the test of time as it’s made from hardwearing steel enamel (W60cm x D50cm). 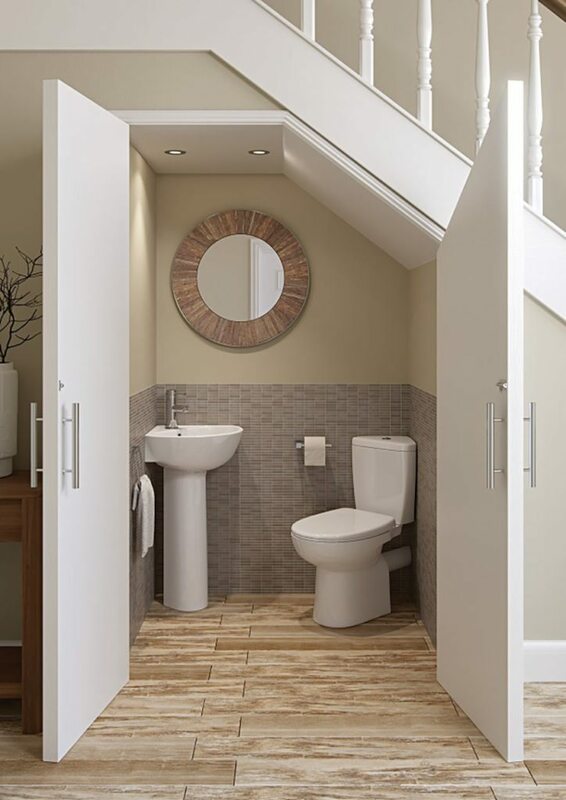 Cloakrooms are ideally suited to underused spaces such as underneath the stairs. Other popular options include sectioning off a space in the entrance hall or creating space in a porch area. “A benefit of creating a cloakroom on the ground floor of is that guests don’t have to go upstairs,” says John Wilson, product training manager at Bathstore. “This is ideal for older, less mobile house-guests and has the added benefit that there is no need to tidy up upstairs before they arrive. So you can focus on the food preparations. Or the wine,” he adds. 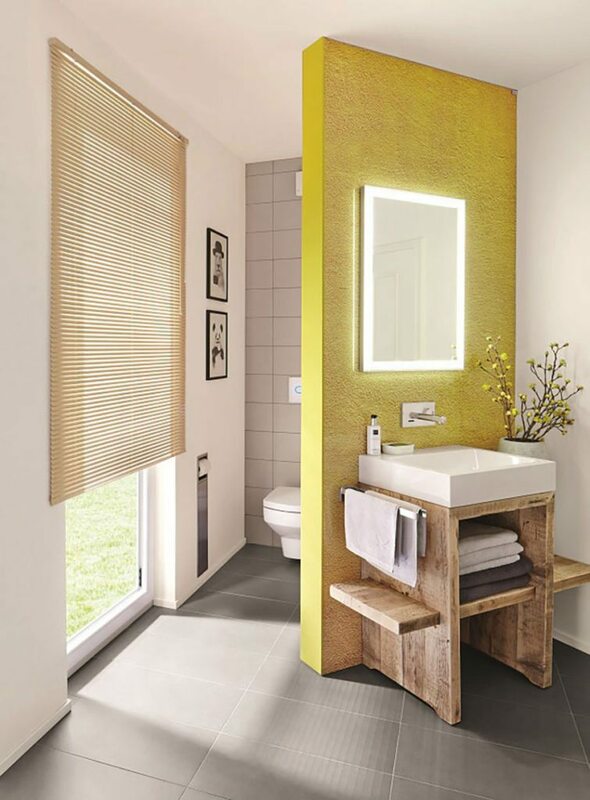 “To benefit from as much light as possible, it’s worth trying to position a cloakroom on an outside wall of the home as this will enable you to introduce a window and really flood the smaller space with natural light,” adds Tina Robinson, product manager at Heritage Bathrooms. 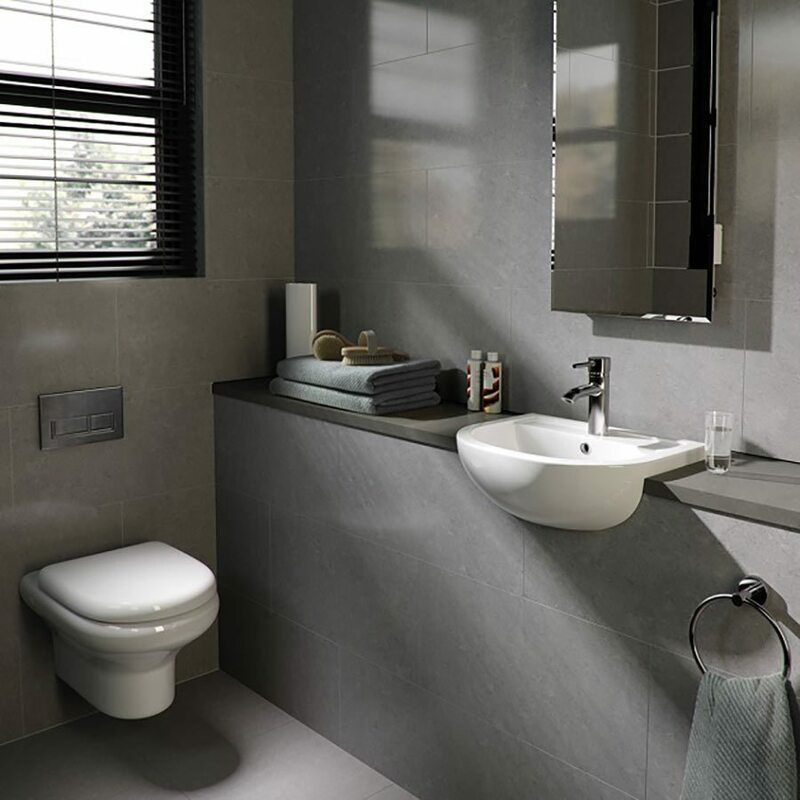 The Micro Space range from Bathrooms to Love includes this close-coupled corner WC, priced from £205, and corner cloakroom basin with full pedestal, from £125. 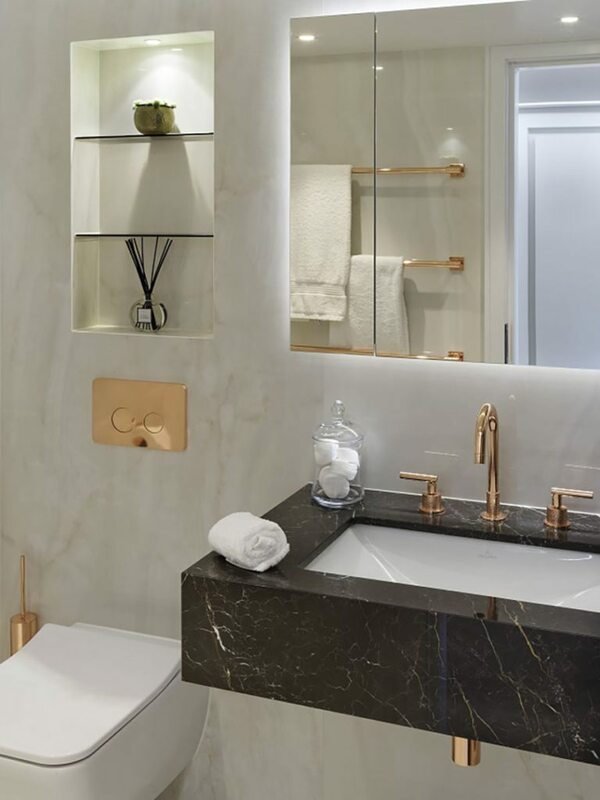 Contrasting gold fittings add a contemporary twist to the white and stone floor and wall tiles. This colour scheme helps the room look larger than it is. A similar cloakroom by Shed Living would start from around £1,500. The layout of your home’s plumbing will affect how you plan your cloakroom. Waste water from the WC and basin needs to run to the nearest soil stack, which is normally located outside the house. Seek the advice of a professional plumber at the planning stage to assess what’s right for your home. The same applies to hot and cold feeds. They’re generally less tricky to plan for, but it’s best to speak to an expert early on in the process to check what needs to be done. 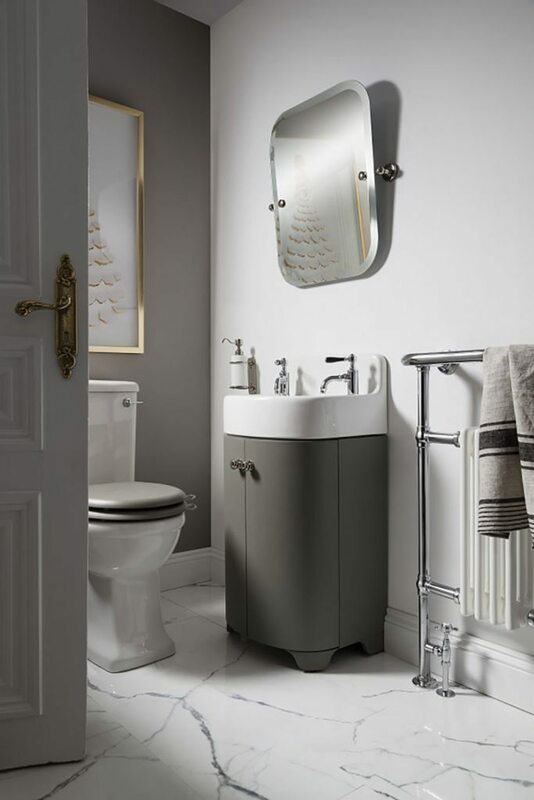 Add a dash of cool colour to your cloakroom with this dark olive 50cm floor-standing vanity unit and cloakroom basin from Arcade Bathrooms, priced at £798. Test your bathroom planning skills at Frontline Bathrooms or Heritage Bathrooms using their free 3d bathroom planner tools. Featuring a compact wall-hung WC, 40cm slimline semi-recess basin and Petit Mini Mono mixer in chrome, this chic cloakroom suite in white ceramic is £705 at Frontline Bathrooms. “If you don’t have space for a radiator, underfloor heating is worth considering as it will free up wall space and can be much more affordable than you think,” advises John. Alternatively, look for a small but effective radiator model. “The majority of cloakrooms are quite small so radiators don’t have to be large to be able to warm up the space,” John continues. If plumbing for a radiator is an issue then there are a variety of electric towel rails available. Laura Ashley Bathroom Collection’s compact Pavilion range includes this wall-mounted washbasin (W50cm x H19.50cm x D28cm), priced around £197.50, and back-to-wall WC (W38cm x H42cm x D55cm) from £443.50. One light source (such as a pendant or wall light) will probably provide enough light for such a small room, but a single light can leave the room feeling one dimensional. 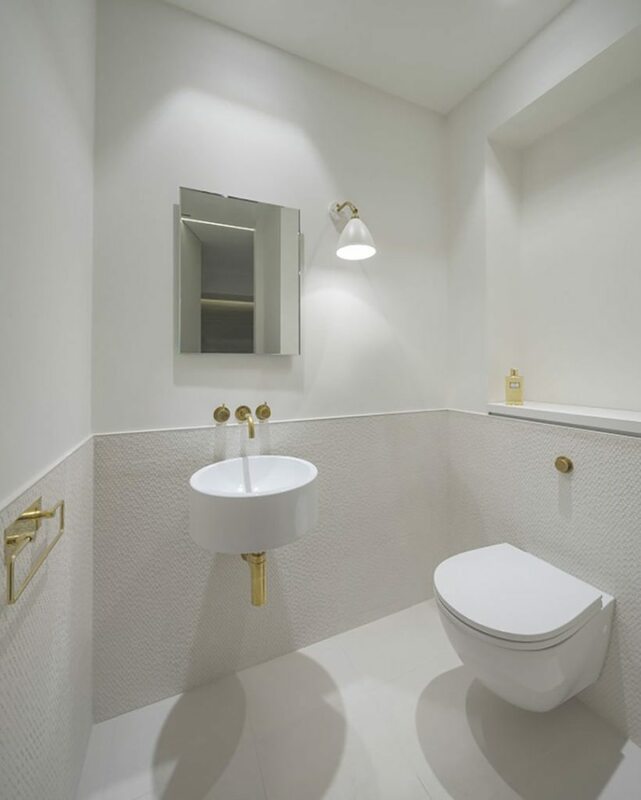 This lighting scheme by Design Plus Light comprises recessed dimmable LED downlights (around £70) that provide general light to the basin, and dimmable LED striplights under and above the bathroom cabinets (around £100 per m) to give a diffused ambient light that lifts the impression of the space. Image source: Goddard Littlefair. The most important place in a cloakroom is the mirror, stresses Sanjit. 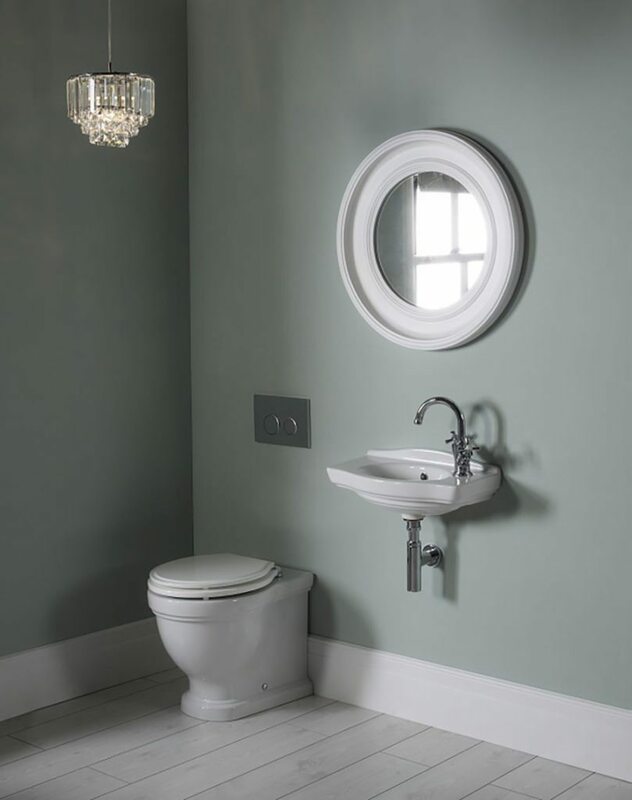 “This is where your guests are going to come and check their make up – so make sure you give them good facial light.” A downlight will light the basin well but it’ll create shadows under the eyes, so use a pair of wall lights or integrated lighting in the mirror to give a more realistic reflection. Lighting was designed to accentuate the beautiful features of this bathroom by Maisha Design. 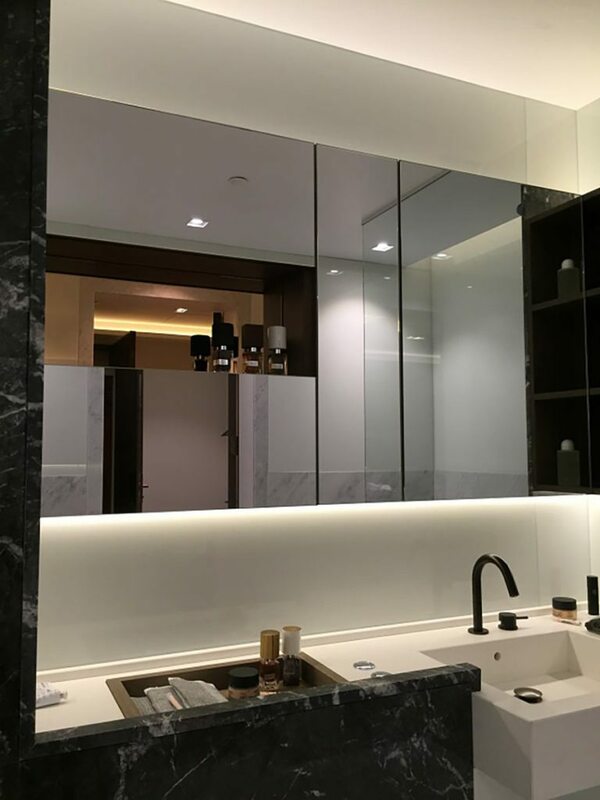 A subtle focal point was created by downlighting the niches, while a sensor-activated LED light under the washbasin creates a beautiful floating effect and a soft night light. A similar bathroom by Maisha Design would cost around £8,000. Check out our round-up of the smartest space-saving solutions here.